At last, the truth can now be told. In our latest report, The Heterosexual Agenda: Exposing The Myths, we examine the statistics and the case studies that dispel many of the myths about heterosexuality. No longer satisfied with “mere acceptance” by our society, heterosexual political pressure groups have launched a well-planned, well-financed campaign, which, if left unchecked, threatens to destroy the most fundamental structures of American society. This report considers the implications of the heterosexual agenda (both overt and hidden), the problems it has already caused and its potentially disasterous results for society. Here is where the buck stops — no hype, no exaggeration, no fear-mongering — just the facts. Whether you are personally impacted by heterosexuality or simply concerned about this controversial issue, you will be informed and challenged by The Heterosexual Agenda: Exposing The Myths. Download your copy today! And while you’re at it, don’t miss our companion report, How To Write An Anti-Gay Tract In Fifteen Easy Steps. 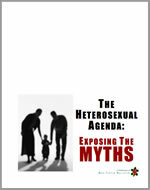 The Heterosexual Agenda: Exposing The Myths is a parody. It was modeled after various pamphlets, books, CDs and videos produced by Agape Press, the American Family Association, Americans for Truth, the Center for Reclaiming America, Concerned Women for America, the Corporate Research Council, Exodus, the Family Research Council, the Family Research Institute, Focus on the Family, Ignatius Press, the National Association for the Research and Therapy of Homosexuality (NARTH), Parents and Friends of Ex-Gays (PFOX), Renew America, the Traditional Values Coalition, World Net Daily, and so many other organizations, publishers and authors too numerous to mention. My thanks go out to these tireless organizations and individuals for providing the inspiration for this parody. 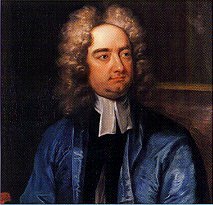 And while my humble efforts will never match his, I also wish to express my admiration for Jonathan Swift, for famously mocking powerful and influencial leaders who looked upon people as mere statistics.